austindogandcat.com: Will work for kibble Forget doggy-tinis and Burberry animal carriers. Has pet ownership itself become an unaffordable luxury? Will work for kibble Forget doggy-tinis and Burberry animal carriers. Has pet ownership itself become an unaffordable luxury? If you were looking for a pet-owner mascot for the reckless boom years, you could hardly find one more fitting than Britney Spears. The poor, beleaguered pop star became the scourge of animal rights groups when she picked up a $3,000 Yorkie at a Bel Air pet shop in Los Angeles in July 2007 after a mere 30-minute visit, at a time when she was having trouble caring for her own children. President Obama, meanwhile, has said that finding the right dog for his girls has been "tougher than finding a Commerce secretary" and has modeled the proper way that responsible grown-ups become pet owners in a recession or at any other time: carefully considering the needs of all the members of the household (in this case, his oldest daughter's allergies), waiting until the existing family is settled into its new digs before inviting in a new member and, of course, doing the most socially responsible and politically correct thing and getting the pet from a shelter or rescue group (even when one happens to be the kind of guy who is offered the finest canine specimens from world leaders). But while POTUS and FLOTUS deliberate the relative merits of Portuguese water hound vs. Labradoodle, the biggest pet story of our new, bummer year has been the uncertain prospect of animals at a time when their human companions are scrambling to cover the grocery bills. But as soon as the economy crashed, the pet stories, too, became downright depressing. Newspapers across the country began reporting on shelters filled way past capacity and pets abandoned by their owners in foreclosed houses. On New Year's Eve, the L.A. Times pet blog L.A. Unleashed declared "pets and the economy" their "story of the year" and their editors made it their New Year's resolution to adopt from a shelter and to encourage their friends to do the same. Forget the Burberry pet carriers -- in our brand-new, very bad economy, it was starting to seem that pets themselves might become an unaffordable luxury. When I called up some pet experts and owners, they agreed that animals, like their companions, may be wearing last year's winter sweater for a few extra seasons. We won't But they were wary of suggesting any crisis just yet. Stephen Zawistowski, an executive vice president and science advisor for the ASPCA and author of the textbook "Companion Animals in Society," points out that the recent bad news comes after decades of good news: steadily rising adoption rates and lowering intake rates at shelters nationwide. Statistics are taken region by region, and we won't know for some time what the current numbers are, but the lowest point of animal abandonment in New York City was last year, with a 20 percent increase in adoptions and a 63 percent increase in participation in the mobile spaying and neutering clinic. "It's not getting any worse," he says, of the current state of animal shelters across the country. "It's maybe just not getting better as quickly as it was." So while anecdotal evidence seems to show more pets than usual being dropped off at shelters in the parts of the countries that have been hardest hit by the subprime mortgage crisis -- including Florida, Arizona, Nevada and parts of Arizona -- areas like the Northeast, the West Coast and the Upper Midwest have seen record rates of adoptions. Some shelters in Vermont and New Hampshire have seen such an increased demand for pets that they've had to import animals from shelters in places like Kentucky and Tennessee. All of this progress means nothing, however, if a worsening economy means people can't afford to take care of the pets they already have. Donn English, an auditor living in Boise, Idaho, paid over $200 when his English bulldog got sick right after Christmas, a week after his daughter's birthday. As a result, he says, "I have yet to pay my gas and electric bill." Laurie Essig, a professor and single mother of two girls living in Vermont, spent thousands of dollars treating her dog's kidney infection, skipping family vacations to visit her aging parents. When her youngest daughter's guinea pig died last Friday, she admits she thought to herself, "Ah, at least there's that much less bedding and food to buy each week." But all the pet owners I spoke with said that, while they might scrimp on a few luxuries, they weren't compromising on the basics. In fact, in true pet owner fashion, some of them found it much easier to sacrifice for their pets than for themselves. "I'd sell a kidney before I'd switch my dog's kibble or expect her to go without rawhides," John Newton, a "broke freelance writer," wrote me in an e-mail, including a photo of his dog, Nena. A recent article in the Washington Times claimed that pets are not only recession-proof, but that sales are actually up. It may be that, much as women allegedly bought more lipstick during the Depression, pet products are the kinds of small luxuries that people can afford in this down-and-out time. And a Shopsmart poll showed that female shoppers -- perhaps spooked by the dog food contamination scare earlier this year -- were refusing to cut corners and switch to a cheaper pet food. So maybe we aren't facing a pet crisis so much as a healthy recalibration of our values, in which we go back to giving our pets only what they actually need. (Meanwhile, in a sign that the ostentatious luxury pet market might be going to the dogs, New York's Pet Fashion Week was canceled this week.) Considering the anxiety and stress of our current age, it's good to remember that pets come with all sorts of benefits that make them undeniably useful to their broke, stressed-out owners. Andrea Higbie, a financially strapped freelance writer in Dallas, says that her vet pointed out that her cats are an excellent way to lower her blood pressure, which helps her justify the $46 diet kibble that he recommended for her twin Siamese cats. And a particularly creative survey on the American Pet Product Web site claims that pets can lower healthcare costs -- apparently pet owners "make fewer doctor visits, especially for non-serious medical conditions." And sometimes pets can help out their owners in even more unconventional ways. Last month, John Henion, a severely underemployed filmmaker and co-founder of the blog unemploymentality, got a phone call from a guy who used to offer him production work. "He said, 'Hey, how are you doing? Sorry to hear about you getting laid off. Actually, I'm calling about your dog.'" While the guy didn't have any work for Henion, he did offer his dog a spot on a film shoot. "It was sort of adding insult to injury," say Henion, who spends most of his time blogging about being unemployed. "It was $350 for a half day's work. That's my day rate!" In the end, Nando was cut from the picture. (Henion admits that he's still hoping Purina might check out his head shots on his blog and make an offer.) But even though he's feeling particularly broke, Henion considers spending time with his dog among the best parts of being unemployed. "A lot of being unemployed is just about sitting in front of job boards all day, hitting refresh," he says. "Nando is my excuse for getting out of the house. We take much longer walks. Here we are, on a weekday afternoon, walking in 78 degree weather. It's good for me, and it's good for him." 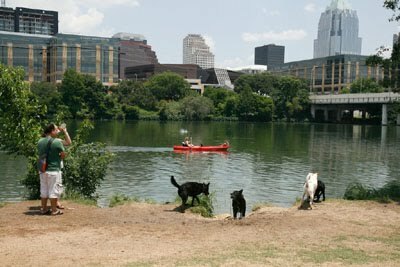 Austin Cat Fanciers "Lone Star Mardi Gras"
Miko at Meet & Greet Friday 7-8:30 p.m.
Busy Bee Dogs - Valentine Dogs - Rev It Up!